10 Frozen Birthday Party Supplies Under $10! You are here: Home / Great Deals / Amazon Deals / 10 Frozen Birthday Party Supplies Under $10! Disney’s Frozen is an insanely popular theme for birthday parties this year. 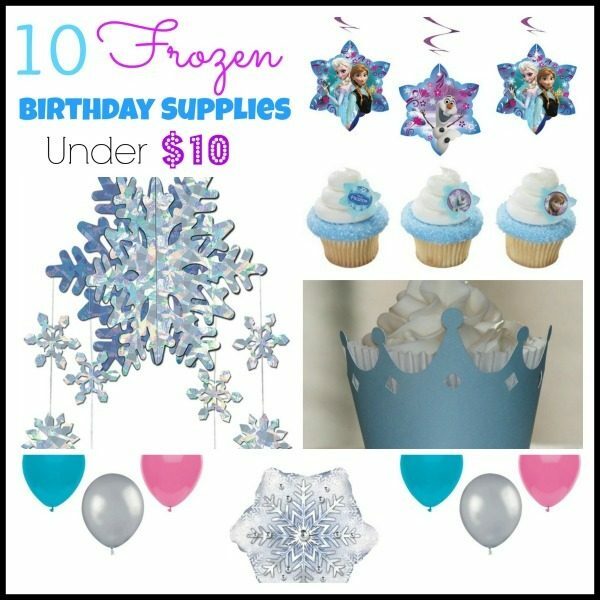 If your little one has her heart set on a party featuring Anna, Elsa and Olaf, and you don’t want to break the bank when it comes to decor, you’re in luck – we have a list of 10 Frozen Birthday Party Supplies Under $10 for you! 3-D Snowflake Mobile Party Accessory – $4.31 + FREE shipping! Pink and Green Frozen Plastic Table Cover, 54 x 96″ – $4.70 + FREE shipping with a $25 order! Disney Frozen Hanging Swirl Decorations, 3 ct. – $4.99 + FREE shipping! Frozen Cupcake Rings,12 ct. – $5.12 + FREE shipping! Frozen Inspired Happy Birthday Party Sign – $6.99 + FREE shipping! Frozen Balloons Expansion Set – $7.35 + FREE shipping! Frozen Birthday Balloon Bouquet – $7.75 + FREE shipping! Frozen Birthday Party Banner – $7.99 + FREE shipping! Anna & Elsa Cake Topper – $9.02 + FREE shipping! Shimmer Light Blue Crown Cupcake Wrappers, Set of 12 – $9.50 + FREE shipping!